It’s the elephant in the room at almost every dinner table. Or, to be more precise, the cow, pig or chicken in the room. Many Australians like eating animals, but they rarely stop and think that those animals all want to live. 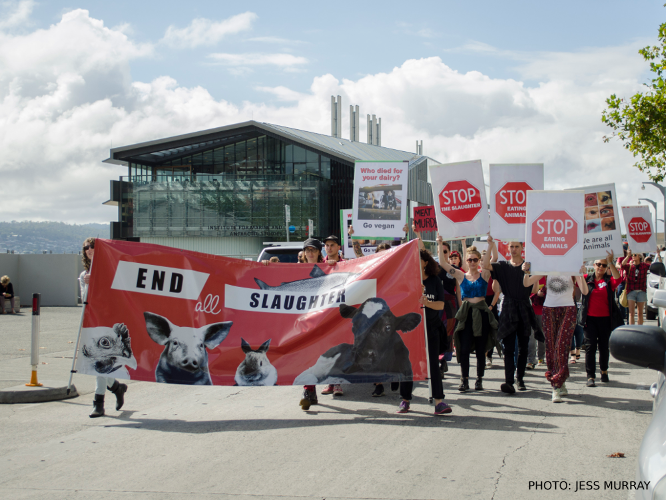 Around two hundred animal advocates in Hobart will join together in Salamanca for the March to End Slaughter. They will call on the consumers, government and corporations to get serious about creating a fairer world for all animals, adding their voice to thousands marching in capital cities around Australia on this national day of action. Joining Animals Tasmania with stalls in Parliament Gardens will be Animal Liberation Tasmania, the Be Fair Be Vegan campaign, and the Animal Justice Party Tasmania. “This could shape up to be the biggest animal rights protest Tasmania has ever seen. We certainly hope it will make many people take notice, and think about their food choices. Everyone has a role to play in ending animal suffering.” said Mr Simcox. The Hobart event is part of a wider international campaign, with almost two dozen cities, including Paris, Istanbul and Tokyo, scheduled to host similar rallies later this year. “This year the March coincides with the opening of the duck shooting season in Tasmania. Despite the horrific suffering inflicted on innocent native waterbirds each year, the Tasmanian government still allows it. The courage of duck rescuers will be honoured today, as we highlight the slaughter that begins on the wetlands.” concluded Mr Simcox. The March will commence at 11.30am and proceed from Princes Park, Battery Point, down Salamanca Place to the top of the market, before turning onto Castray Esplanada and proceeding to Parliament Gardens. Animals Tasmania exists to promote respect and kindness towards all non-human animals. We represent all animals, no exceptions.